It’s almost Christmas and I just drove over to the offices of the Silicon Valley Leadership Group to pick up my Turkey Trot medal… so I figure it’s about time I wrote a few words about it. 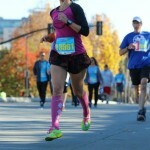 Many weeks ago, I decided on a whim to run the Silicon Valley Turkey Trot 5K. Well, it wasn’t really a “whim,” a friend talked me into it. I was in an offseason, going on six weeks. And I didn’t decide to “run” it, I decided to “race” it. Or, like I told my training buddies, I was going to smash myself. Jumping into a 5K with six extra pounds of offseason weight (OK, eight, but who’s counting?) and with what would be three weeks of training is not the smartest idea. I went from doing a few leisurely runs a week to doing a few hard runs a week. Every run was either a track workout, a tempo run or a tough, hilly long run on the trails (those were the easiest, and that’s saying something). 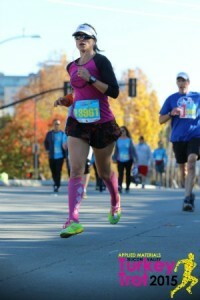 In short, I knew I had gone “soft” in muscle and in spirit, and needed to remind my body what it feels like to suffer. Because the truth is, in a 5K you do nothing but suffer. If it’s your first 5K, you suffer. 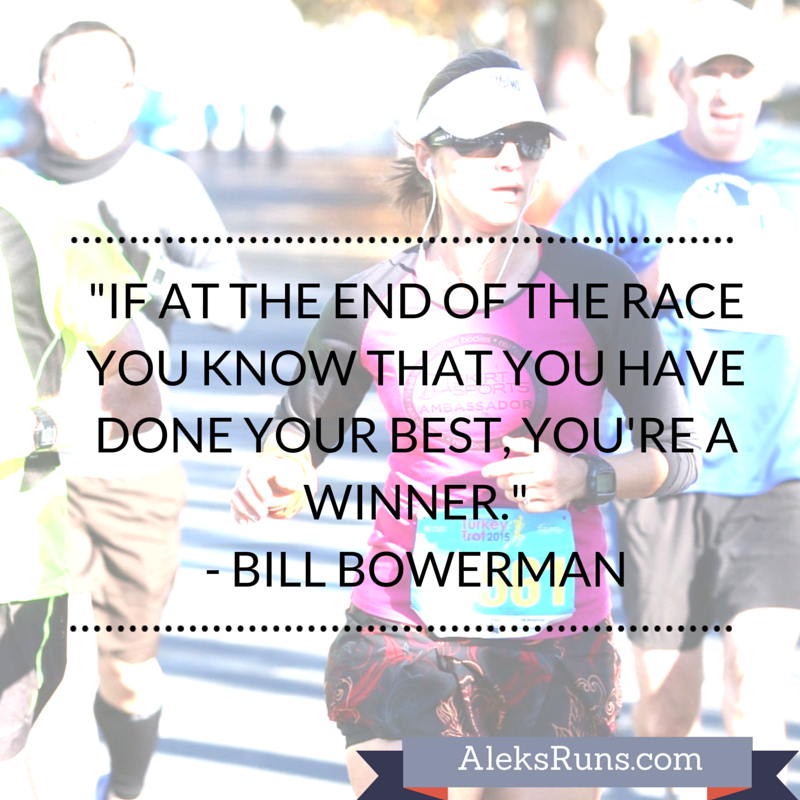 If it’s your second 5K and you’re trying to improve your time, you suffer. If you’re trying to podium… you suffer. By Thanksgiving, I was ready to suffer. I parked by a friend’s house and ran the 1.5 miles to the start; then we went over to packet pickup and back — and by the time the start gun went off, I had already logged about 3 miles of running and walking. This was actually just right: if you’re going to make yourself suffer, you need a proper warmup, especially on a chilly morning. Speaking of the race start: I was nervous about that, because the SVTT is the largest Turkey Trot in the country, with 30,000 runners. The crowds were insane! So, I lined up with the first wave and stood about two rows back from the runners at the very front. Now, those are pretty darn fast runners (count the number of 16-min finishes among the top race results and you’ll see what I mean) and I felt totally out of place. But the sign for our wave did say 7:00 min-mile or faster, and I was hoping to run that pace, so there you go. My 5K PR at that point was 21:55, which I ran this summer while on vacation in my home town. It was a hot, humid day, the route had a quarter-mile section with a slight incline at the start/ finish, and the overall distance that may or may not have been a wee bit short. It wasn’t a certified, timed race, just a free 5K run part of the ParkRun series that are becoming ever so popular in Europe and even here. In other words, I was hopeful that, with better weather and a completely flat course, I’d be able to improve that time by at least a measly second. Then the gun went off and whoosh! I darted off with the crowd and in my hurry, fumbled with my Garmin, only later realizing that I had not, in fact, started it. How much time had I not marked on my watch: five seconds? fifteen? twenty? I didn’t know! That messed with my head immediately, since now I had no clue how far I was (from the finish) and, most importantly, was I going to PR or not? Isn’t it ridiculous how dependent we’ve grown on our multiple devices? How did runners twenty years ago pace themselves without GPS watches? I will spare you the mile-by-mile details, they all felt miserable. I did wonder for the first mile and a half if I should try to go just a bit faster and see if I can hold on to the pace until the end. But as I crossed the finish line grunting, squeezing my right side and immediately bending over to calm down the nasty stitch I’d had for the past half mile, I knew I could not. I could not have gone faster. As hundreds of runners filed by, I stood by a trash can just past the finish line for minutes on end, wondering if I’d throw up or not. I didn’t, so that was a win. I also didn’t know whether I got my PR – and I wouldn’t know for hours on end. Seriously, though: it’s one thing to suffer physically for 20-some minutes, but checking the race results page surreptitiously every 10 minutes during Thanksgiving dinner… that’s a whole other struggle. The race results did show up at 7 pm that evening, and I found out I had run exactly 21:55. No PR, not even by a second. But I was OK with that, because I went in this race to smash myself – and I did. I’ll always wonder if, had I known my exact seconds of running time with a properly-started GPS, I would have pushed myself just a little bit harder in that final stretch. Maybe next year, I’ll find out. Great race! I just went at a 5K as well with off-season weight (some serious binging on vacation) and also in the heat and humidity of south Florida. I didn’t run an overall PR but it was a hot weather PR for sure. 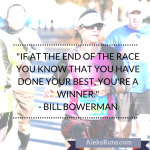 Congrats on a great race for you…sounds like you still have lots of opportunity to get faster! So exciting!